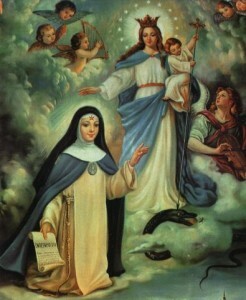 The order of the Conception Immaculate (OIC), was founded by Saint Beatriz de Silva for “Contemplating the Mystery of God in the mystery Conception Immaculate of Maria”, it is there where it finds all its roots and reason of being. This Reason of being is translated into an intense and pure relationship of the conceptionist sister with regard to Maria, up to the point of which ” this consecrated life, inside as well as exterior, orders to the glory of God and of his holiest Mother ” (Rule OIC). This vocation of the Immaculate share feelings deeply with the Franciscan spirituality and the rich Franciscan conceptionist charisma is formulated: the Immaculate Conception as core, Franciscan evangelical reading, in the contemplative monastic tradition. The fundamental characteristics of the Conceptionist Order are the permanent ones in the monastic tradition, marked by Marian stamp and Franciscan: Trinitarian life, total communion with Jesus Christ, self give to the Spirit Santo, life in contemplation and celebration, brotherhood, poverty and humility, separation of the world. But all it acquires peculiar beauty to the light of the Immaculate Conception of Maria. Maria, in effect, is the example and the criterion, the teacher of content and style, the loving mother, delighted and simple, the Rule of life. The conceptionist is given to live the pursuit, the betrothal with Christ in the attitudes of Maria. The OIC is entirely contemplative. The conceptionist seduced by the eternal love of God, lives the mystery on Christ from the faith, the constant oration, the availability and the quiet concealment, as Maria lived. The sisters who are called to part be of our order emit in their religious profession the evangelical advices of obedience, without own and in chastity; and a fourth vote: perpetual closing. The deep sense of the closing is to be exclusively with the Lord.